UK charity Action on Armed Violence (AOAV) recorded 60,000 deaths from Improvised Explosive Devices (IEDs) across the globe between 2011 and 2013. Besides firearms, the weapons claim more innocent lives annually than any other weapon. IEDs are unconventional explosive weapons that can be detonated in a range of different ways. Despite the scale of destruction they cause, little is spoken worldwide about their danger. In an effort to shed light on the crisis, AOAV released a report on Tuesday examining current efforts to collate data on their use globally. The research, Tracking IED Harm, also explored how important such information is in thwarting and responding to IED incidents. In its report, AOAV considered 18 organizations that currently collect data on IEDs around the world. The organizations ranged from humanitarian aid groups collecting information across borders to domestic organizations collating data on a state-by-state basis. A number of common issues became apparent. Firstly, researchers noted the problem of terminology. The report found that many organizations only record an IED attack if it complies with their definition of a “terrorist incident.” As there is no universal definition of terrorism, confusion often arises. Secondly, the research revealed attacks are rarely recorded in terms of weapon model. Thirdly, it emerged language limitations mean many incidents are not captured with open-source platforms.Fourthly, the report concluded data collection is hindered by geographical limitations. As part of its research, AOAV analyzed the United Nations Assistance Mission in Afghanistan (UNAMA). 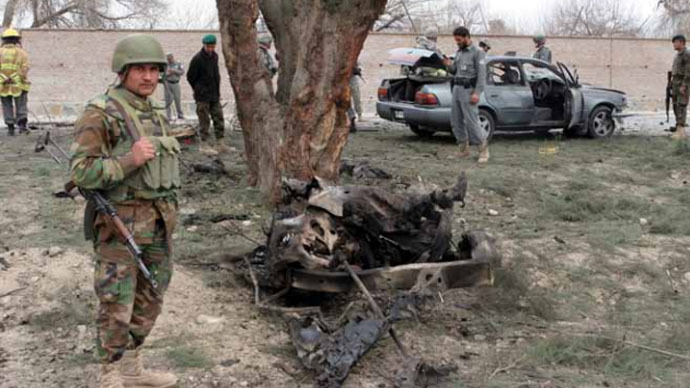 UNAMA has published impartial analysis of civilian deaths in Afghanistan since 2007. According to AOAV, the data collection has had a constructive impact. The organization now challenges those who use IEDS and supports counter-IED strategies. AOAV said much still needs to be done to monitor and record the use of IEDs globally, and their impact on civilians. Commenting on the crisis, UN Secretary General Ban Ki-Moon said the UN should work across borders to set up a common system to record IED deaths. He said this should be carried out as part of the UN’s broader effort to monitor breaches of international humanitarian and human rights law. The Global Campaign Against Improvised Explosive Devices (GCAIED) describes IEDs as an emergent “global epidemic” that are fast becoming a weapon of choice for terrorists and tyrants. Historically, IEDs were commonly deployed in conflict and post-conflict zones, illicit drug operations, political violence, ethnic conflicts, and terror attacks. The deadly weapons have wrought bloodshed and carnage in Iraq, Afghanistan, Sudan, Somalia, Israel, Lebanon, Palestine, Chechnya, Russia, Nigeria, Kenya, Ivory Coast, Pakistan and France. Steven Smith, CEO of AOAV, warned IEDs are responsible for widespread death and destruction across the globe. “Their increasing use has been shown to kill and injure civilians, destroy infrastructure and buildings, and cause displacement on a huge scale,” he said. Smith stressed “reliable, comprehensive data” is an essential means of addressing the humanitarian impact of IEDs.